The IS-BAO conforms to ICAO Annex 6 Part II and Part III, Section 2, as well as many other industry best practices. 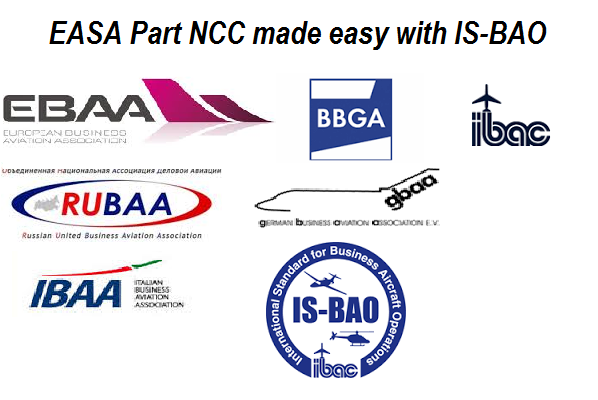 Because both the IS-BAO and Part NCC are congruent with ICAO, an operator can meet their Part NCC obligations via IS-BAO. Utilize the Part NCC / IS-BAO Generic Operations Manual and Gap Analysis Tool by IBAC included as part of the IS-BAO manuals package to ensure all Part NCC items are met. Verify conformity via an independent third party audit conducted by an IBAC Accredited Auditor. Declare IS-BAO Registration as an alternative means of compliance used in meeting the requirements of Part NCC. EBAA and IBAC provides the tools to help an operator meet the Part NCC challenge. Order your IS-BAO today! If you are already a holder of the IS-BAO, you can download the Part NCC Generic Operations Manual from the IBAC website with your login and password used to download the annual revisions.